Who you calling a mug? It’s quite likely that someone is trying to tell me something, but I think it’s great! I really like how the old logo’s “waves” have been turned on their side. In the background you can see the new home of IT Services in the Durning Centre – more of that in a future post! Update: Flickr which I use to host photos is playing up at the moment – might work if you look at the photos direct. 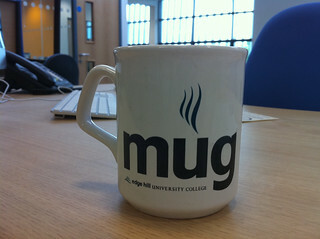 This entry was posted in Logos and tagged durning centre, Edge Hill, it services, merchandise, mug by Mike Nolan. Bookmark the permalink.